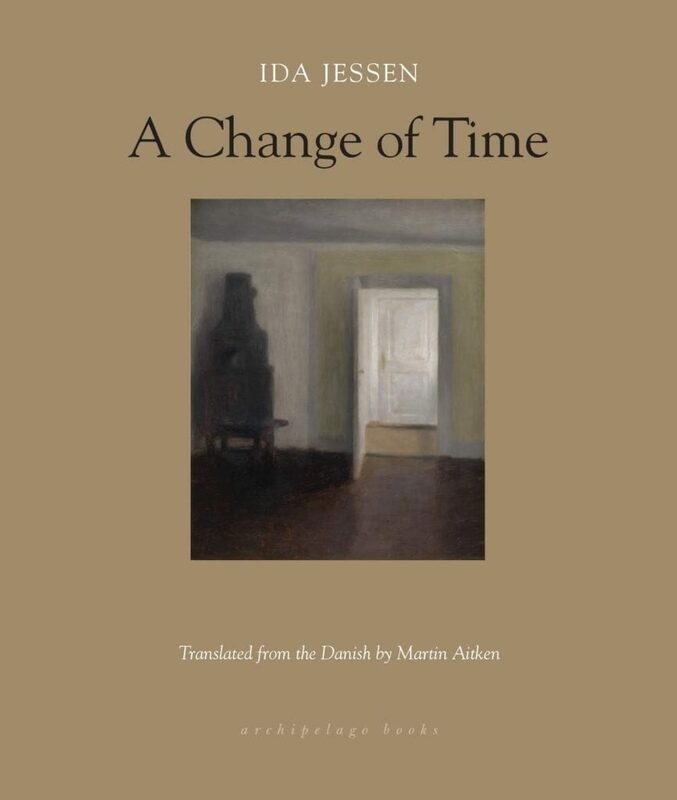 The following is from Ida Jessen's novel A Change of Time. 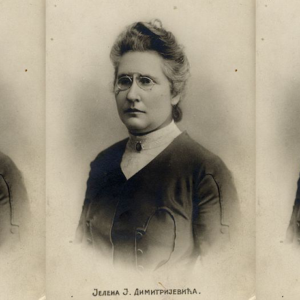 Through winding diary entries, it pieces together the life of a schoolteacher after her husband, the town doctor in 20th century rural Denmark, passes away. Ida Jessen is widely considered to be the master of psychological realism in contemporary Danish fiction. Her novels have won the Booksellers Prize, the Golden Laurel, and a nomination for the Nordic Council Literature Prize. I am on my way now. Everything is packed. I haven’t even the time to write this. I shall continue later. There has been so much tidying up in the house these last few days I thought I would see if I too might have something to put away and conceal. But what could it be? And from whom? I went upstairs nevertheless, and in the cupboard in the spare room, at the bottom of an old munitions box, I found this diary. I have no recollection of it. The weather is odd for October. Twelve degrees Celsius, the thermometer says, and the air is still and damp. The trains can be heard quite clearly. In the same box I found a paraffin lamp with a brass base, which I do remember, and seeing it again made me feel rather glad. It was as black as coal. I polished it and put it in the window facing the garden. At first I wanted it to be seen from the road, but I changed my mind. It casts a somewhat furtive light. A secret friend. That would at least be one thing to conceal. It is lit now. Evening. There is the strangest lull. I cannot comprehend it. Perhaps it has something to do with the lamp, its milky, round globe a full moon held forth by an invisible hand. Again, the train can be heard all the way from Kokborg, ten minutes of trundling and then the long pull in to the station, the whistle of the guard, doors slamming shut. The day has been mild and dank. The air, even now in darkness, grey with moisture. But it does not rain. People come to see me. I am gladdened by their visits, yet also by their leaving. They bring cakes so that I might not be burdened by the baking, and today they offered to make coffee themselves on learning that Line was on her day off. The butcher Schnedler’s wife brought a whole boiled tongue with her, and returning home from a late afternoon walk I discovered a dozen eggs on the doorstep. I look at my hand and urge it sternly to raise itself and pick up the cup while the tea is still hot. But it will not, and does not. I tidied the spare room with the thought of sleeping there now. The two beds in the bedroom make me shiver. The head and footboards are mahogany and boxlike, and remind me of marital custom in India, where it is said the widow is burned on the pyre along with her dead husband. I lit the fire, too. To make it more like a home. The room is never used. The curtains are hardly more than a pleated ribbon at the upper windows. In the sills lay fat, dust-covered flies that had once buzzed and spun while perishing slowly, and no sooner does one think them dead than they start dying all over again. I swept them all onto a newspaper and tossed it into the blazing peat. I cleaned the windows too, and aired the room and scrubbed the floor. I bundled the mat down to the soggy garden and draped it over a bush. The room is now clean and fresh, and yet I do not wish to return to it. It is an unfamiliar place. A sharp smell of soap. I think I shall sit a while longer. This strange gravity, the peculiar peace that descends in the evenings when the houses turn inwards and people retire to bed. I have begun to expect it, to look forward. It requires so very little. That I am alone, and that darkness has fallen. That I light the lamp. That I gaze into its flame. I do not think of day. And yet that is untrue. If I am congealed fat, blood pulses nonetheless in my depths. But the day wails. I cannot be home in the daytime. I go about in great shawls, the cold creeps in at my wrists. My hands are blue! I walked to the station and boarded the train. Stationmaster Haldbo ushered me aboard and said: “We must hope. We hope and pray to God.” He helped me inside to be seated before blowing the whistle. Human kindness is my nourishment, and my fatigue. Why is it not sufficient? I have more than most. My house lies above the hill. It is large and made of red brick, with a red tiled roof and a white rendered cornice, built eight years ago by Iversen, the town’s builder. Between the house and the station lies the pasture belonging to Vester Farm, the grass dappled with cowpats and molehills. But the cows are inside now. And beneath the house, at the bottom of the hill, begins the town, with Johannes’s cobbler’s shop, the dairy, the co-operative society, the grocer Hansen’s big red premises, the grocer Rosenstand’s slightly smaller ones. Borgergade is the high street, and it grows ever longer. When I arrived here twenty years ago the town barely existed. Is it conceivable that it will continue to grow? The Tradesmen’s Association and its members are certainly being kept in business. What will the place be like in fifty years? A hundred? I sat down on a chair by the bed and placed my hand on his on top of the cover. It was icy cold. His finely curved nails had yellowed, the tips of his fingers were shiny. He would be unable to submit a fingerprint now, his distinctive features all receding, his eyes shrunk back, sunken in their sockets, lids closed to cover them, mouth and cheeks collapsed into his face. His gentle flesh is gone, though heaven knows there was precious little to begin with. I put his hand under the cover, only to retrieve it again some moments later to give it warmth, taking it in both my own, which were just as cold, and burying them all in the shawl. The hour is late. A short while ago I stood outside on the front step. The street lights are extinguished now, and the lamp on the station’s gable end. If a person knew no better, they might think there were no streets at all, no houses, no people, no dogs. No fields ploughed, no hen coops, no sheds. One might think it all reclaimed by the heath. Or that we had never been here. Last evening, while standing on the step and thinking myself to be in the middle of nowhere, the air was still. But two hours later I awoke at the sound of the window rattling, and all day the wind has been getting up. The stationmaster Haldbo greeted me with his hand firmly on his hat to prevent it blowing away. At that time, late morning, it was as if the horizon were cut in two in the horizontal. Blazing yellow below, darkness above. “Can this weather not be driven away?” he shouted through the gusts, helping me into the carriage with a hand at my elbow. She didn’t recall in what way exactly. But it was to do with him asking her to find him a pen and paper. He had lain there a while with the pen in his hand. “He’s quite exhausted now,” she said, ushering me into the room. She measured his pulse, then smoothed the covers. “You must be hungry,” she said. A moment later she returned with a cup of tea and a cheese sandwich. The chair. I took his cold hand in mine, and in a short time mine was cold too. When after a while I let go, I saw his index finger curl into the cover and straighten again. It repeated. I felt upset for having let go too soon and by it having occurred on the cover and not in my hand. I went out to find Nurse Svendsen and asked for pen and paper, thinking that if he wanted to write then I would do so too. I would leave him a letter. It took me some time, though it contained little of substance. It was nearly four o’clock by the time I was finished. I asked for an envelope and stood the letter by the bedside lamp, instructing Nurse Svendsen to give it to him when he woke up. I just had time to catch the train home. It had started to rain. The wind buffeted the carriages and the window steamed up as soon as I entered in my wet clothes. I was the only passenger in the compartment between Give and Thyregod. The hedgerows looked like they were doubled-up in the fields. I arrived home to the cold smell of cigar that lingers in the living room, and the peat box was empty. Line is still off. I have told her not to give it a thought and that I would let her know when to come back. She has returned to her mother in Uhe. I lugged more peat up from the cellar and hurried to light the fire. Our peat comes from a bog at Vorslunde now and has less sand in it than our own. Porridge for dinner. I put Winterreise on the gramophone and removed it again almost immediately. Only when the place is completely quiet am I comfortable. As if this were how one kept one’s equilibrium. The lamp is in the window. What did I put? I thought so hard about it that I can recall nothing but my efforts to think of something appropriate. If one is offered a single chance to speak one’s mind, what does one choose to say. Whatever one says, the exact opposite can always be said too, and with equal justification. Only then do I realize that the gale has subsided. I go out onto the step. The street lights have been put out, the station lamp too. Not a dog or a crow to be heard. A silence greater than silence. The town is weary, flogged by wind. The letter was gone from the bedside table when I arrived at the hospital today. Nurse Svendsen came in with a cheese sandwich and a cup of tea and was full of talk about autumn and winter, with which she has difficulty coping, being from milder climes on Fyn. “Oh, but you’re from Ryslinge,” she remembered all of a sudden. “You’ll know all about it, then. Does a person ever get used to it?” I said she would. She stood and was chatty. It made me glad, and I was reluctant to let her go. The room was silent when she left. I ate the sandwich and drank the tea, which was good and strong and hot. His face was unaltered since yesterday, the orbs of his eyes covered by the deathly membranes of his eyelids. Always, I have wanted to look into his blue eyes. The fire of that urge burns still, though I have long since become an old wife. How I have yearned for its flame to be extinguished. For no embers to remain. Nothing that might ever reignite. Consigned to the ash pan. “Look,” I said out loud. “Look what I’ve brought you.” I held a hand up in front of his face, trying to fool him. I sat down. A short time later, I said: “Open your eyes.” He didn’t. And yet I had the feeling he was awake. Excerpted from A Change of Time by Ida Jessen. Translated from Danish by Martin Aitken. Used with permission of Archipelago Books. Copyright © 2019 by Ida Jessen.